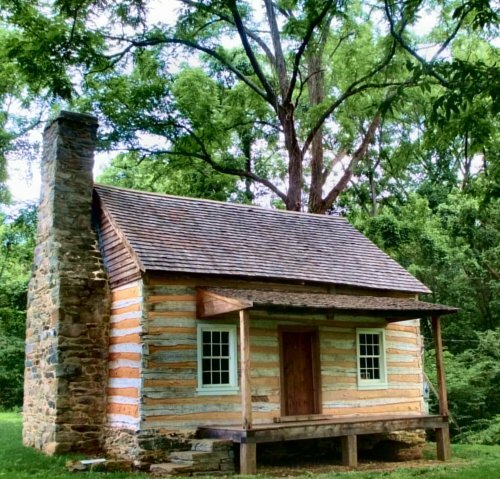 The Snickersville Academy--a simple log cabin, built by the settlers from native stone and trees--operated for about a half-century under the supervision of a group of volunteer neighborhood trustees. The Academy sits in a wooded spot behind historic Carrington House--right by the mountain stream that runs down through the back yards of Bluemont houses along the southeast side of Snickersville Turnpike. Amos and Elizabeth Clayton, who lived in the stone manor house known as Clayton Halland who would have 12 children between 1800 and 1828?donated a half-acre of their land behind the stone tavern across the street, now known as Carrington House. The Snickersville Academy served the community as a free church (we now use the term, ecumenical church) for 25 years. Then in 1851, about a decade before the Civil War, a new generation of neighbors built the villages old stone church (now the Bluemont United Methodist Church). But all through the Civil War (1861-1865) and afterward, the villages children kept on coming to this one-room, rural schoolhouse to learn how to read, write, do arithmetic, and understand the wider world. In 1872, the multi-classroom Mountain Shadow School, the villages first public school, was built near the old stone church. The old schoolhouse became rental housing for almost a century. In 2010, when the Hatcher family sold their mountain farm to Boulder Crest Retreat (a new place of respite for military and veteran families), they gave the Snickersville Academy and the land on which it sits to Friends of Bluemont. The buildings restoration that began then is now complete.